Disclaimer: We are affiliates of some of the companies that we mention in this article. We may, therefore, get paid should you sign up using our links. However, this article is based on real data from real customers (including us) and is, therefore, largely objective. Give you a table showing some of the companies that you can use to get star ratings. Talk about the types of Star Ratings. Explain Seller Ratings to you. Explain Product Ratings to you. Show you how you can get Seller and Product Ratings. Any of these companies will help you get Star Ratings in Google! You may have noticed that when you look up a product or service on Google, you sometimes get results that have gold stars on them. These constitute a rating system that is used by Google to denote the performance of either a seller or a product. Star Rating extensions come in a number of types. The table below is a live illustration of some the types of star Ratings that can be found out there. Missing from the screenshot are Local Ratings, which can mainly be found in Google Maps. Below we take a look at Seller and Product ratings. These, along with local ratings, are the main types of star rating extensions that every business should be on the hunt for. What are Seller Rating Extensions? Seller Ratings are an automated part of the Google Ads program that uses a star based review system to give people an idea of the quality of the service that is offered by a particular seller. 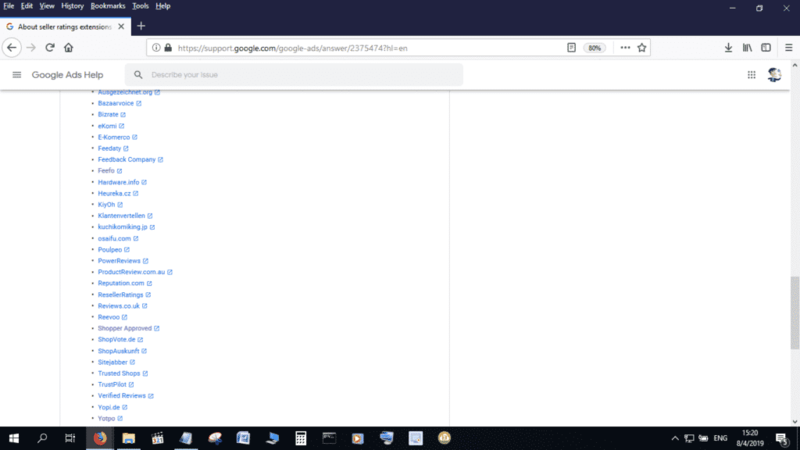 A good example of the system can be seen in the screenshot below. Seller Ratings inform shoppers that you’re an authentic business with a good reputation. Your business website’s star rating is displayed alongside your ads. Once your business’s Google Merchant or AdWords account is in place, setting up your Google Seller Ratings is easy. The simplest method of obtaining Seller Ratings is by including reviews from a Google approved third-party review aggregator on your store domain. Check out some of these companies in the table above. Seller ratings require a minimum of 30 reviews to be eligible for being displayed on Google.com. Additionally, the minimum average of these reviews must be 3.5 stars. Product Ratings are different from Seller Ratings. While Seller Ratings inform shoppers that you’re an authentic business with a good reputation, Product Ratings or Reviews provide vital information to online shoppers about a specific product. Product Ratings help shoppers make swift purchasing decisions. As an advertiser, these ratings help you drive better-qualified traffic to your business website. Google shows product ratings on Product Listing Advertisements in eligible nations. Product Ratings are shown using the same 5-star rating scale that is used on Seller Ratings. These stars indicate aggregated review and rating information for the concerned product, gathered from diverse sources such as users, third party aggregators, merchants, and editorial sites. You need to have at least 50 reviews on all your products to qualify for the Product Ratings program. A product must have a minimum of 3 reviews to have star ratings shown in ads. It isn’t mandatory for you to have a Google Merchant account for your ads to be entitled to seller ratings. Shopper Approved is a third party product review aggregator that also provides merchant (seller) reviews. If you have a business website and sell products/services online, you need merchant reviews in order to get Google Shopping Star Ratings. 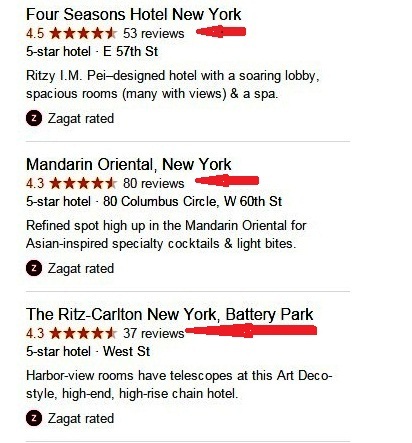 These merchant reviews are the highest visible online reviews. 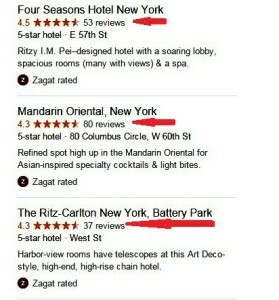 Merchant reviews are shown in various strategic locations including on Bing, Yahoo! Ad, and Google AdWords networks. If your business is localized; for instance, a restaurant, hair salon, plumber, doctor, or if you run your business from an on-the-ground location, you’ll need local reviews. A third-party reviewer such as Shopper Approved has many ways to collect reviews and ratings from your clientele. The good thing about Shopper Approved is that it can get you Local Reviews, Merchant Reviews, and Product Reviews. Remember what we said about some companies only offering product and not merchant reviews. Well, Shopper Approved pretty much has you covered as far as Google’s product ratings program is concerned. If you market physical products online, you need to collect product reviews besides merchant reviews. 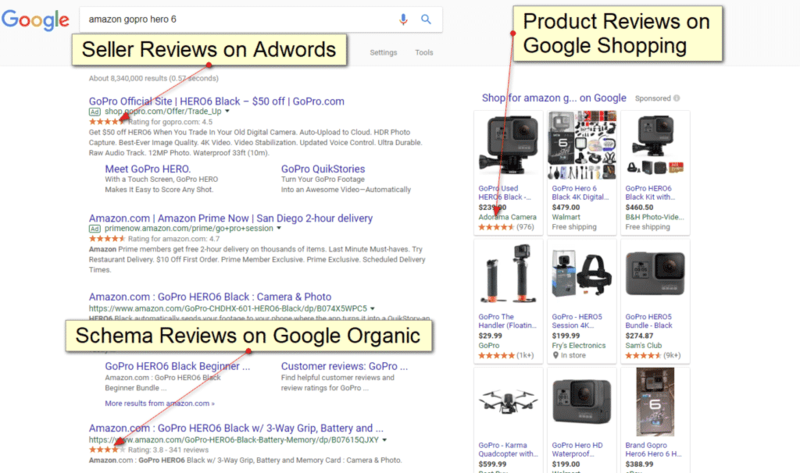 Product reviews are displayed in Google Shopping and in Product Listing Ads (PLAs) in strategic places to enhance your listings. Shopper Approved offers you the most competitive pricing in the 3rd party reviews aggregator category. The company is totally upfront and transparent with its pricing. The company’s pay-as-you-grow model presents you an opportunity to collect customer reviews and ratings easily and affordably as your business grows over time. Shopper Approved has revised their prices. Now, the pricing begins at $99/month. BUT the pricing at Planet Marketing for Shopper Approved remains at $79/month! Take advantage of the large price difference today. This bargain offer expires soon! Save almost $20 per month (almost $240/year). Collects more reviews and ratings compared to other 3rd party review aggregators. Customer Resolution helps you to address customer concerns and resolve them. Donates generously to charitable causes. Your clients automatically receive invitations to review your products and services. The ability to embed reviews into your website. Beginning at $299 per month (paid annually), Trust Pilot’s pricing is above that which is offered by Shopper Approved. The thing to note however it that you can negotiate with the company to get a better deal. To try out Trust Pilot, click on this link or on the big banner that’s above. Product Ratings are, unquestionably a critical factor in gaining the trust of people who view your Ads. This gives them the confidence that they need to try out your product and services. 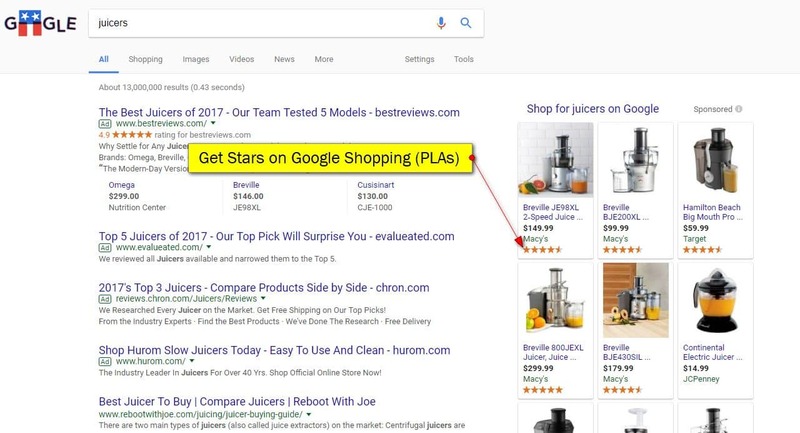 We have already noted that merchants who share their customer reviews with Google can see an increase in their PLA clicks. This in turn will drive more sales for their businesses. Product Ratings are merely an extension for PLAs. Google Shopping Star Ratings give you the edge that you need to stay ahead of the competition. Online shoppers can view information on seller and product reviews through “Click-Type” reports. Therefore, positive reviews and ratings guarantee you more business. Disclaimer: We are affiliated to some of the companies that are mentioned in this article and stand to get paid should you decide to sign up using our links. However, this article is based on real data from real customer and is, therefore, largely objective.